Ashford United have certainly been in the news over the last two weeks. 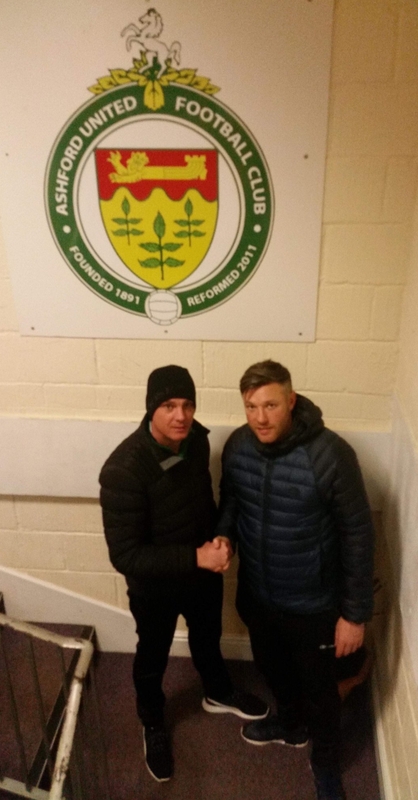 First they parted ways with Coach Paul Barnes who took the reigns at Greenwich Borough and then they announce that Gary Alexander will replace him, so effectively they had a job swap, with Gary taking over the Manager role from Jason Whitmore in the Summer and bringing in his own assistant. Alexander done a superb job at the Eltham based club and has put them in a superb position from which they may gain promotion this season. He will now bring the experience with how to build a club to challenge at the right end of this Division with the contacts that he has in the game plus he seems to have a way of bringing in high level players to go on the journey with him. The perfect example of this was how quickly he has managed to get George Kamarusi to return to Homelands and assist with the next stage in the History of the club. George is loved by the Ashford fans after being a major part of the promotion winning team last season. He is a huge presence on and off the pitch and will be the key building block from which this new house can be built. Also brought in, this time on dual registration with Bromley, is Ola Williams. The right sided centre-back is a young man with a bright future in the game and will be a big asset to the club. There are sure to be more over the coming weeks and months as the new regime assess the current squad and prepare it for what will surely be a more impressive season next time around. Of course a lot of work needs to be done in turning the team into winners and this was highlighted perfectly last Wednesday when they lost 9-1 to Cray Wanderers. Now Cray are an excellent team and will probably win the League but that is one hell of a beating and certainly shows everyone the turnaround that needs to happen. The potential is there, average attendances are over 250 at home and that is sure to rise with the new buzz around the club. Numbers like that can create a decent budget as does the 3g surface which provides a stream of income throughout the week. All this was not available to Alexander at Greenwich, where attendances were half the amount of Ashford, yet he still built a strong competitive team. The outlook is very good for the club, it will be worth watching what goes on for the rest of the season. He is a big name in these circles so there will be more eyes than usual looking at the club. Who will be next to join the Ashford revolution? Who knows? But for sure I will be watching and waiting to find out.